One of three stylish, beautifully produced, spiral bound journals to organize plans and ideas with storage pockets for seed packets, business cards and magazine cuttings. Provides a beautifully illustrated organizer for any gardener to record their plans and projects and store key information on their garden. 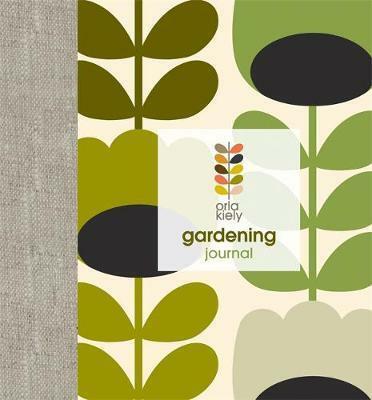 There are graph paper pages for plans and sketches, guided pages for notes and planting records, checklists of key gardening equipment and storage pockets for seed packets, leaflets, magazine cuttings and business cards. Illustrated throughout with Orla Kiely striking and much-loved illustrations and featuring real-cloth quarter binding. Orla Kiely began her career studying at Dublin's National College of Art and Design and the Royal College of Art. She is the visionary and founder of a brand that is appreciated by an audience across the globe. An expert on print and color, she has created her own world that is renowned for its individual voice and unique perspective on both fashion and home ware. Her flagship store in London's Covent Garden is the epicenter of a global business that has won four prestigious UK Fashion Export Awards. Her ready-to-wear and accessories are presented seasonally at London Fashion Week, and her work extends into luggage, stationery and home ware. The Orla Kiely design studio has collaborated with many leading brands including Heal's, Apple and Uniqlo. In 2011 she opened her first US store in New York. Her new Orla Kiely House collection, which includes furniture, lighting, ceramics and textiles, was launched at Design Junction in September 2012 as part of the London Design Festival. Inspired by mid-century modern design, the collection combines Orla Kiely's distinctive flair for color and form with her understanding of function and practicality.